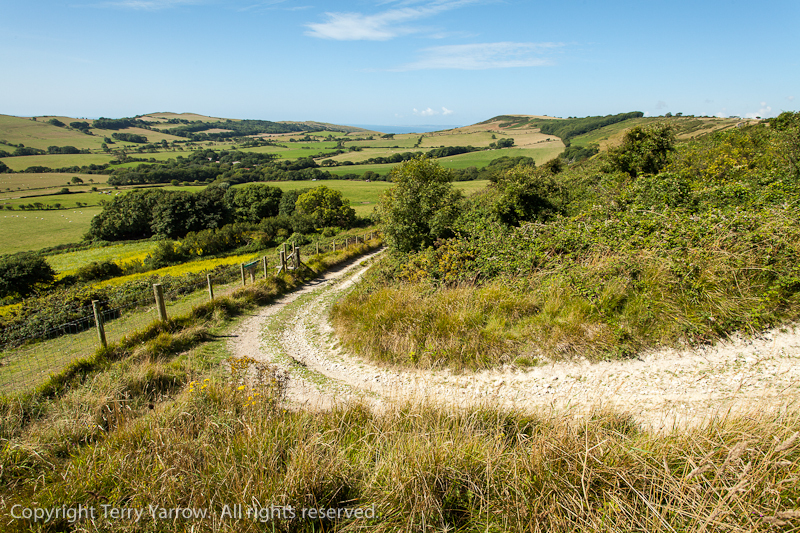 Of dappled sunlight, amazing views, ridges and valleys, and some lost cows! What a difference to last year! 2012 was wet, wet, wet; 2013 has been sunshine and warmth, making for some wonderful walks and very pleasant evenings. Despite my ankle problems, I managed to get out on the trail again this week although I trod with care. The X-Ray is done and I now just have to wait for the report…….and in the meantime I will continue to tread carefully, and walk on :)! This walk started on a ridge top although my route immediately took me down into the valley along a stony track which definitely needed care as the last thing I needed was a twisted ankle. The problem with these rough tracks is that you have to watch where you are walking, and with views ahead like the one below, it is hard to watch the ground. It wasn’t long though before I came out onto a country lane. Now I really like walking along country lanes because the walking is easy and you can fully take in all that is around you. 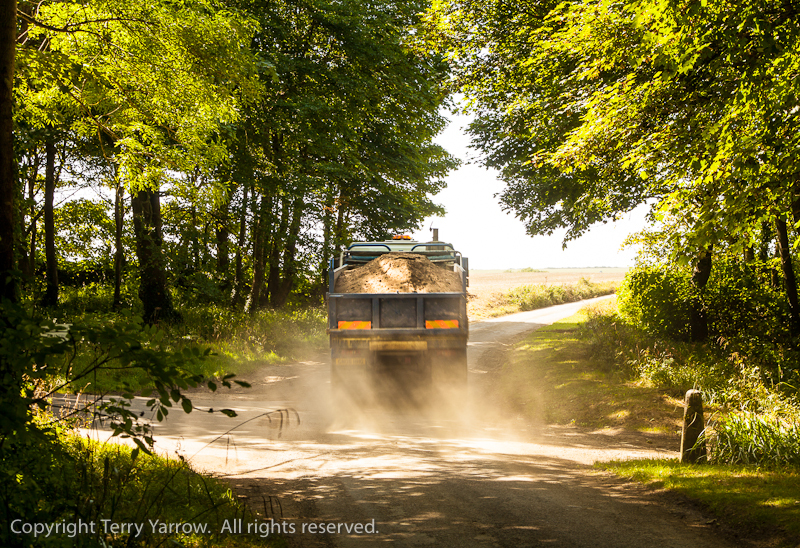 However, that is provided the country lane is quiet…….which this one normally is…….except in the school holidays! I found myself stepping into the hedge with monotonous regularity to get out of the path of passing cars. With beautiful dappled sunlight and amazing views ahead, it was still lovely despite the traffic. 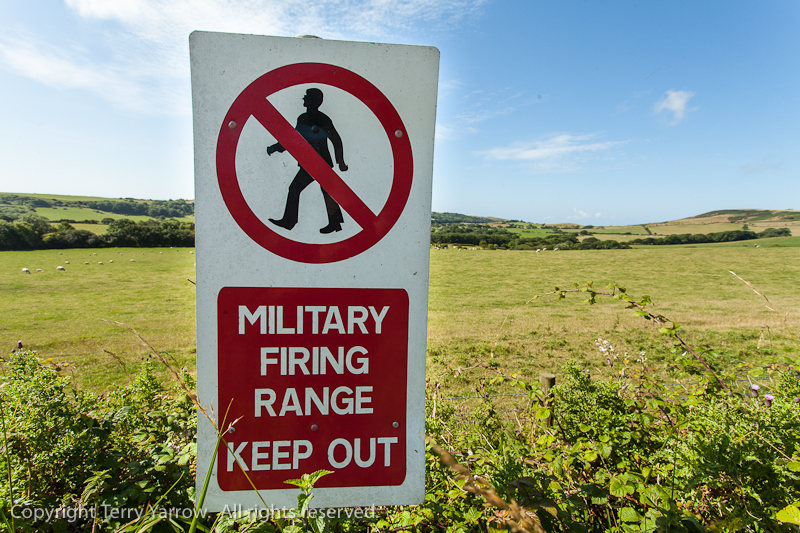 In fact, with signs like the one below, you wouldn’t want to step too far into the hedge :)! The lane led me into one of those typically Dorset hamlets, with a manor house, a farm, a church and a cottage or two, nothing more. Most of these settlements date back to manorial days before transport was easy and people needed to live near their work, and their lordly employers. I was pleased to see the cottage below being re-thatched. I have walked past it many times and have always felt sad at the poor state of repair into which it had fallen. These cottages are so typically Dorset and they look so picture post card perfect but with those tiny windows, they must be quite dark inside. As someone who loves light and the outdoors, I am not so sure that living in one would suit me. 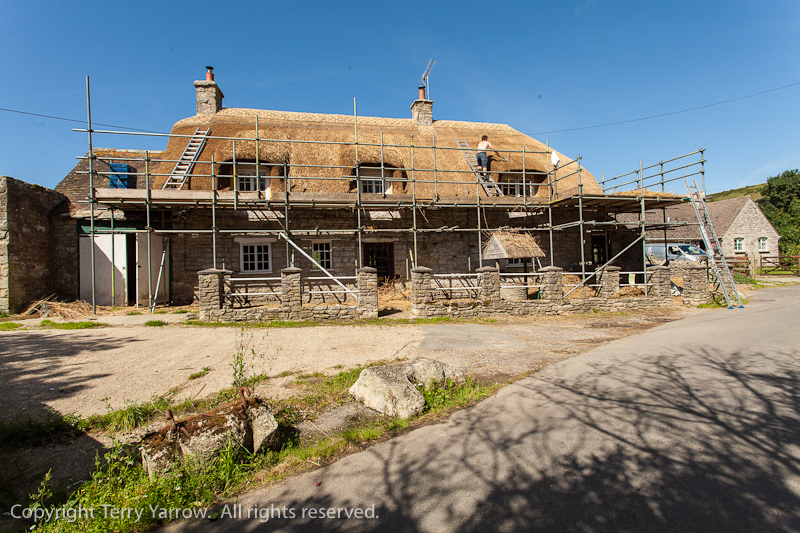 And I’m not so sure I would want the huge capital cost of re-thatching either as it has a limited life span, not to mention the high cost of insurance! 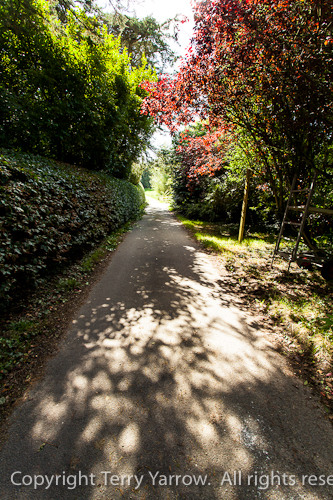 Continuing through the hamlet, my route took me along a wonderful quiet lane with dappled light filtering through the patchwork of leaves and branches above, highlighting the colours in the foliage. With the ladder leaning against the tree it was like a Hardy scene and I almost expected someone in a smock to be picking apples. 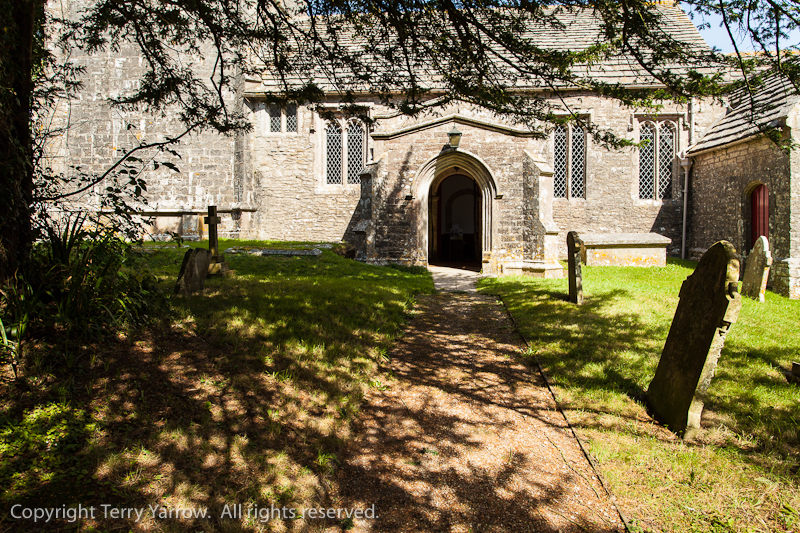 And on to the church with its graveyard where in Thomas Gray’s words, ‘Each in his narrow cell forever laid, The rude forefathers of the hamlet sleep’. I wonder what this hamlet was like in their day! Who were they and what stories could they tell? And of course, yet more dappled light with the sunshine filtering through the overhanging branches of the ever present yew trees. Just beautiful! Leaving the village behind, I continued across the fields and past one of my successes :)! In amongst the trees there is a small wooden bridge which once was broken and impassable and which badly needed replacing. There is a system in Dorset whereby you can report problems with footpaths and I do this regularly – the bridge has now been replaced :)! I have spoken before about good farmers who reinstate paths after fields have been ploughed up or planted, as opposed to ‘bad’ ones who don’t. This little wooden bridge leads onto the field of a good farmer who always reinstates the path by driving his tractor diagonally across the field. 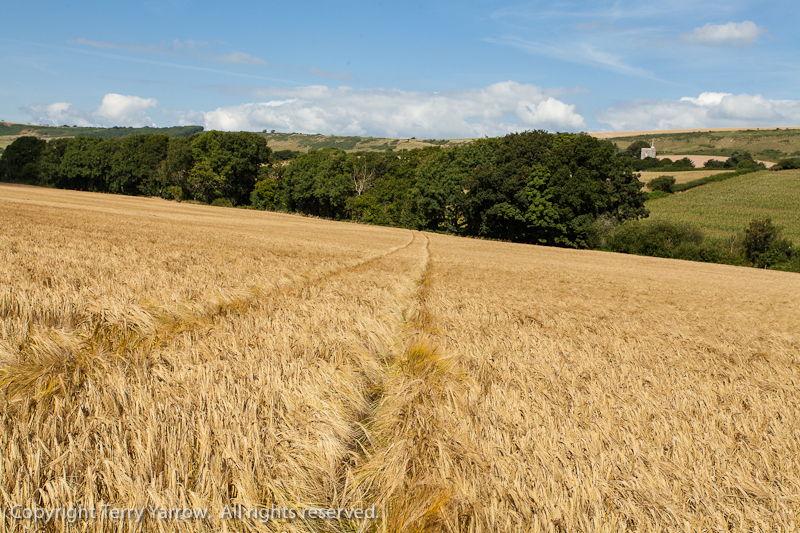 I stopped part way and turned to look back down the ‘tram lines’ to see the church now far in the distance. 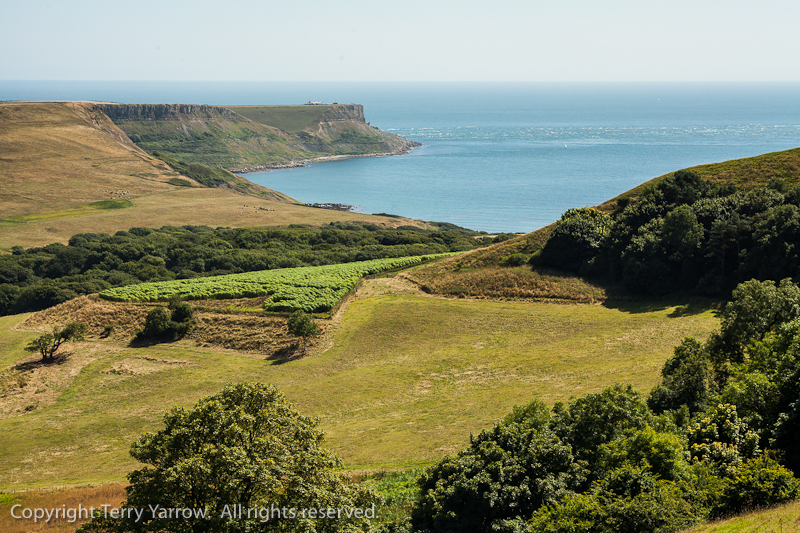 One of the highlights of this walk is undoubtedly the section that traverses the ridge just inland of the coast path – often I would walk along the coast path itself but sadly due to the many serious cliff falls last year, that path is still closed. As sad as that is, the inland route is equally beautiful with a fabulous panorama which covers 360 degrees. 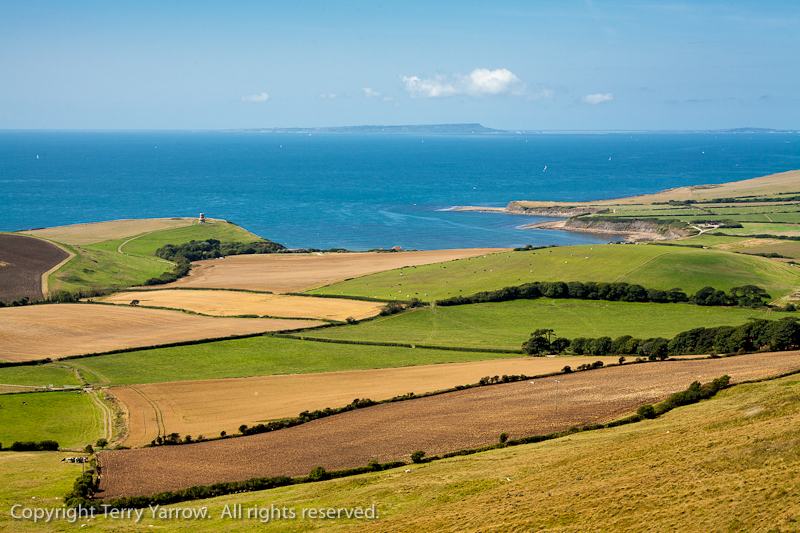 Just gaze in wonder with me for a moment, feel the sea breeze on your face and smell the countryside. One of the good things about this walk is that when you leave one view, the next is not far away. Walking round to the next valley brought another vista to be enjoyed and as it was past lunch time, I sat on the hillside and ate looking out onto the scene below. Where better to eat! 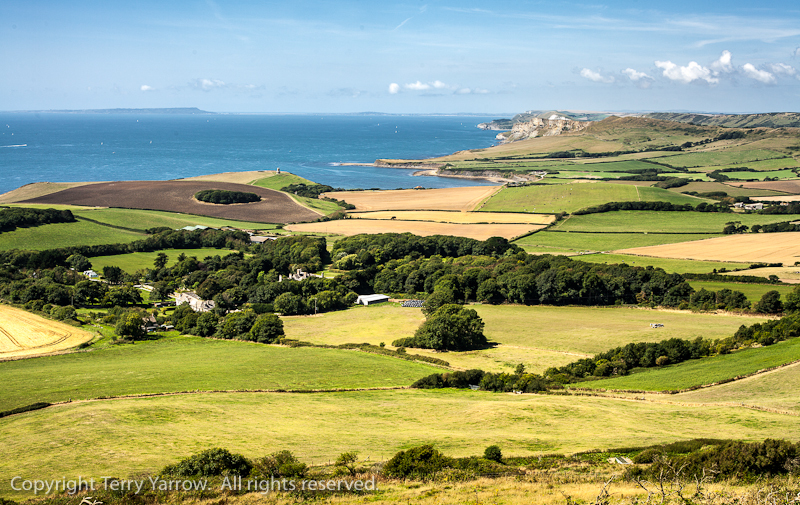 This valley is truly amazing, a huge bowl with a ridge of hills round three sides and the sea on the fourth, and with another of the Purbeck mansions sitting in the middle, with of course its associated farm. This whole valley and surrounds changed hands a few years ago for £25M. What a place to live! In the picture below, I have tried to capture the whole amphitheatre although it never comes across fully in a small picture. And all around the top of the bowl runs the path that forms my way onwards, and what a lovely path. This is one of those paths that I call ‘bare foot paths’, beautifully grassy and flat and the sort of path that when I was young we used to take off our shoes and socks and walk bare foot along. So refreshing on a hot summers day, and so liberating! These days I keep my shoes on but it always takes me back to my youth :)! 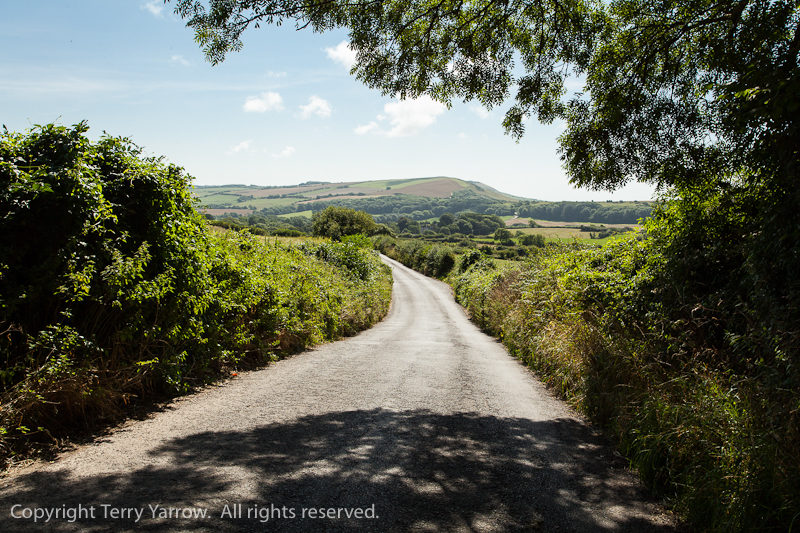 Having circled the valley perimeter, my route took me on to another country lane – another normally quiet road that was not so quiet today! Clearly some work was going on somewhere as trucks came past me kicking up dust. Still, as someone once said, ‘If life throws you scraps, make a patchwork quilt’ – the trucks might be a nuisance but they provided some good photographic opportunities :)! 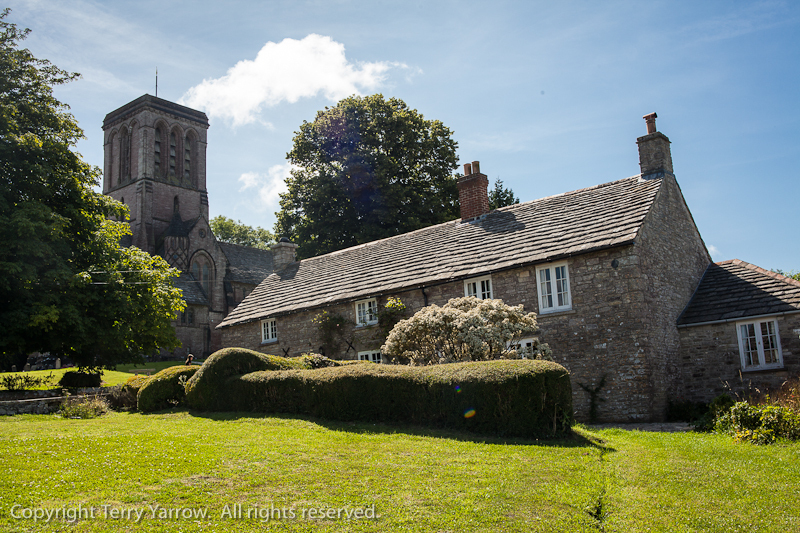 The lane eventually took me into the hilltop village with its lovely array of cottages and its well known church which is often referred to as the ‘Cathedral of the Purbecks’ because it is far too grand for a small Dorset village thanks to the generosity of the Lord of the Manor. I said before that this is a walk with one view after another – well there was another just round the corner. 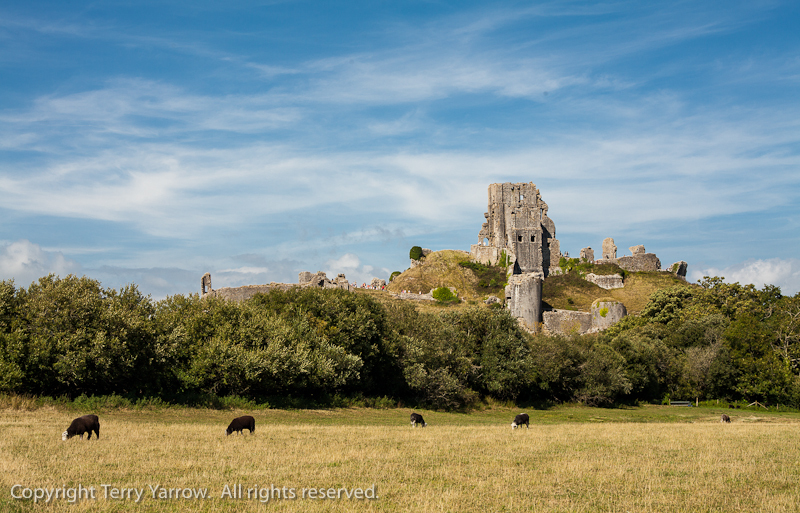 Walking down another of those old gravel tracks which seem to criss cross throughout Dorset, the view suddenly opened out and the famous old castle came into view far down in the valley. 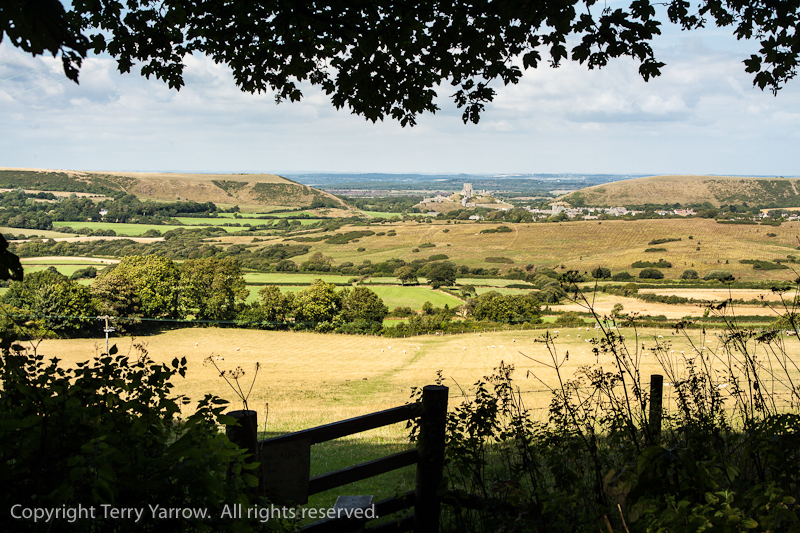 Crossing the stile, I continued down the hillside and across the common towards what is probably one of the most popular towns in Purbeck. Although I love this town, when I am walking, I try as far as possible to avoid the busy places as I would rather be out in the wilds. So I skirted round civilisation, just grabbing a closer shot of the castle standing proud on its hilltop. And a little farther on, there was a sad reminder of something that I had heard on the news earlier in the day. 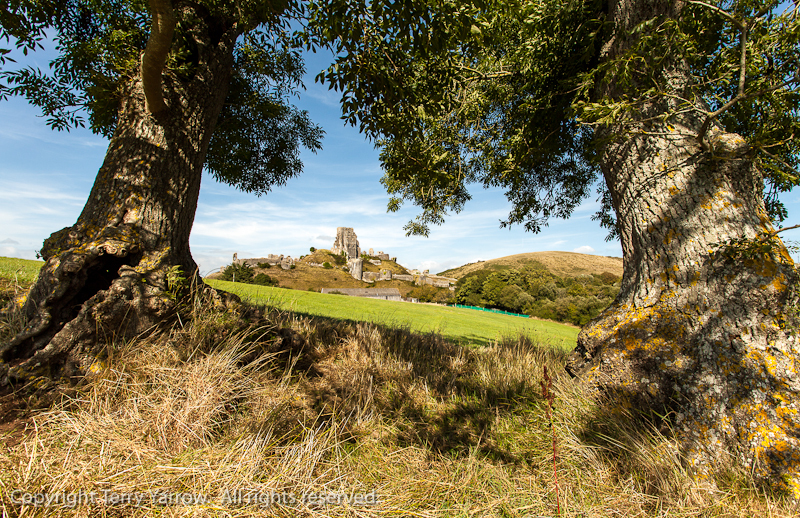 The picture below shows the castle framed between two ash trees and I called it ‘Ashes to Ashes’ partly because of the two trees, partly because of the nearly destroyed castle, but also because sadly the Ash Dieback disease has come to Dorset. Up till now, the county has been pretty much clear of it and these two ash trees have had a long life. I wonder how much longer they have though :(! 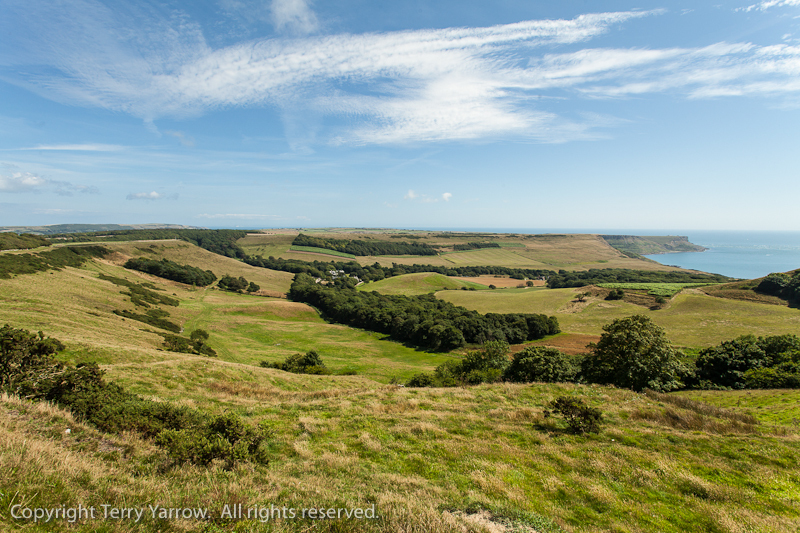 The final part of my walk involved a climb up onto another ridge, the Purbeck Hills from which the area takes its name, and yet more glorious views. And yet more bare foot walking paths too :)! Flat, wide and grassy, just what was needed with my bad ankle. It was along this section that I had one of those odd experiences. Half way along, the path drops down to a road that crosses the ridge and a lady approached me and asked, “Were there any cows up there?”. I assured her that there hadn’t been and asked somewhat tongue in cheek, “Why, have you lost some?”. In fact she hadn’t! She was actually working for the county council environmental health department and apparently there had been a complaint about a cow with an eye infection – she was looking for that cow. When she described where it was, I was able to point her in the right direction which was another nearby ridge. It was interesting chatting to her – she had been doing this job for 20 years and it involved investigating complaints and visiting farms throughout Dorset. Since it was a lovely warm summer’s day, I thought what a great job that must be…..until she pointed out that she does the same thing in freezing winter weather when she can be knee deep in mud and other farmyard materials! It didn’t seem quite so idyllic then ;)! 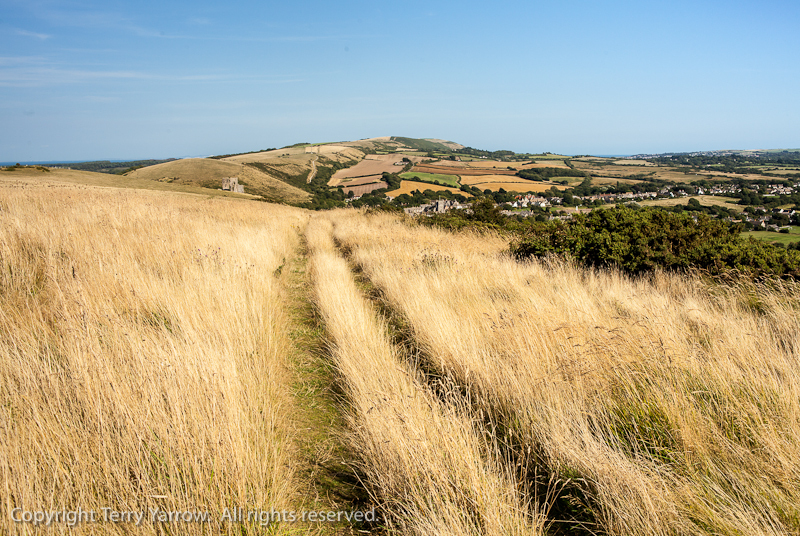 I was nearing the end of the walk now and the evening sun was setting, creating a beautiful warm glow across the hilltop and picking out the long grass which seemed to be aflame. 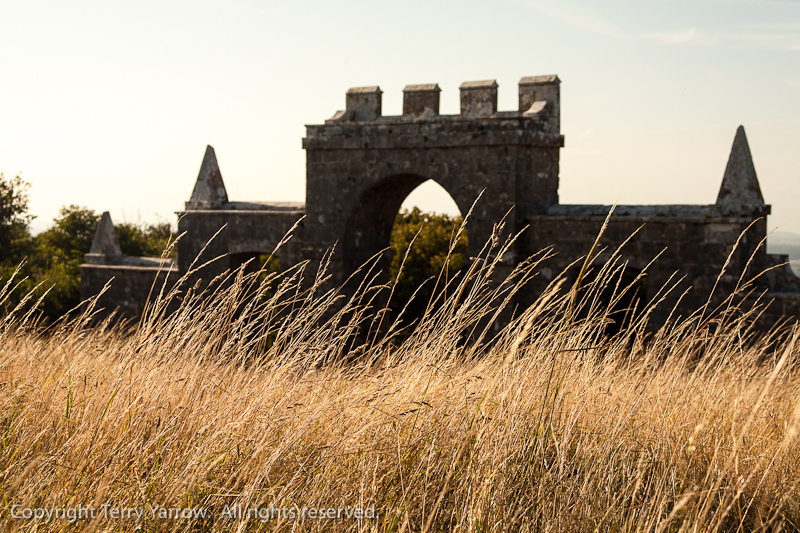 The evening was very still and balmy as I passed the castellated arch which stands on the ridge above yet another old Purbeck mansion. The house itself sits in the valley below and the arch is in fact nothing more that a folly that can be seen from the house but it always adds a little bit of mystery in the fading light. I sat a while and just drank in the scene, and some water too before heading back to the car. What a wonderful walk! So many views, such great paths, fabulous weather, and lots of memories to carry with me always. I hope you enjoyed walking with me! 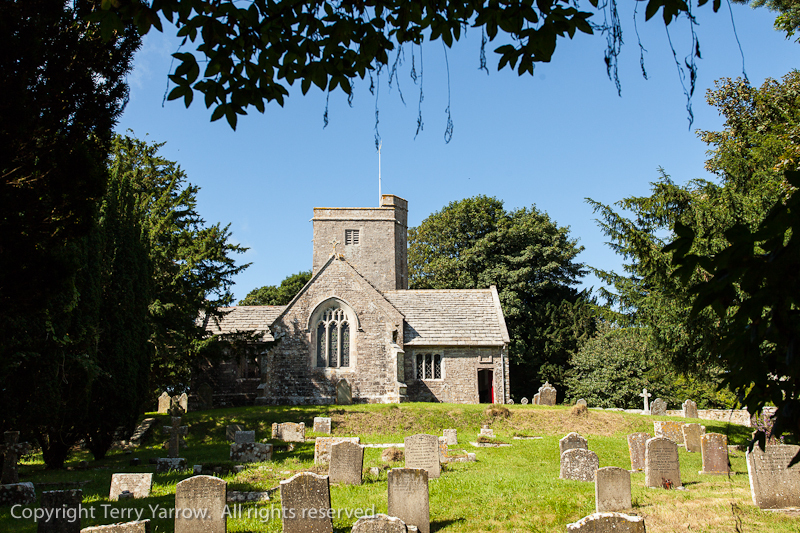 Next Holloways – walking Dorset’s labyrinthine paths! Liz and John here. We absoluttely loved walking this walk with you. 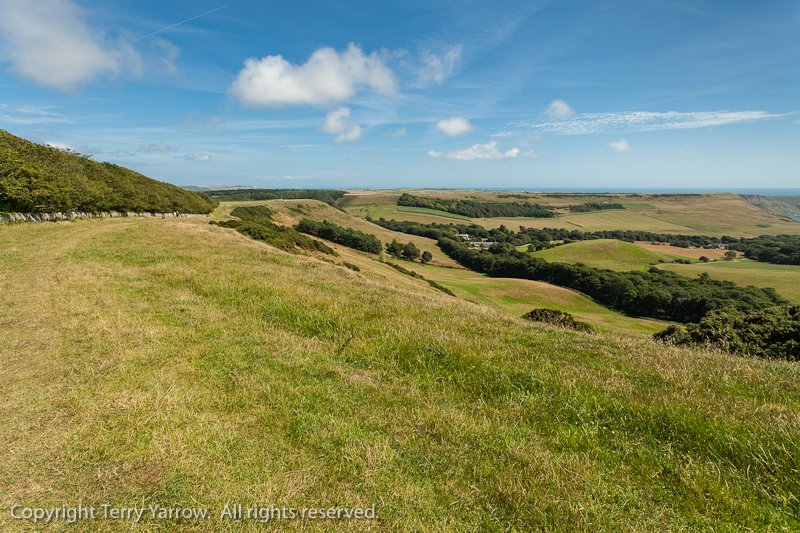 We have actually walked a lot of that countryside on our stays in Clavell Tower. Take care of that ankle !